Why You Should Choose This Pyrford Log Cabin for Your Home & Family. An addition to the modern garden is a log cabin as they are strong in appearance and the natural wood blends in naturally. And this is where the ‘Pyrford’ L Shaped log cabin scores. Its delightful design and appearance and its ability to fit into any garden in a corner plot make this an ideal garden room for your family. The corner style is particularly pleasing to the eye and this means it can fulfil a massive range of uses. So whether you want to use it as a summer room, a fitness area, an office, recreation room, hobby room or an area for your kids (they will love you for that) the ‘Pyrford’ L shaped cabin ticks all the boxes. Key to this is the great design built in as standard. Super Strength As Standard So No Extra Charge for this. 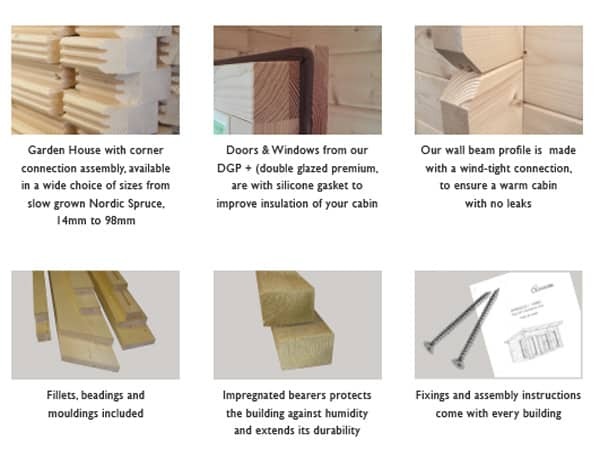 The selection of slow-growing Nordic timber is an easy choice as its qualities mean it can face, with ease, all that the British weather will throw at it. It’s a well-known fact that the Swedes have utilised these great virtues for generations and it’s only now that we are just starting to catch up. The denseness of this Nordic timber gives it the stability and ruggedness to face up to all types of weather. The well thought out design enables these L shaped log cabins to have all the timber working together and this makes this building even stronger. The order of the day is to use quality Nordic timber and whilst it’s possible to make log cabins with cheap material and maybe save a few pounds it’s better to make them with the correct timber in the first place. You will find, relatively speaking, that it’s only a small difference in the cost meaning the best value log cabin does not have to be a ‘cheap’ cabin. By manufacturing log cabins down to a price restricts these cheap log cabin makers from manufacturing long-lasting or soundly built buildings. Where ever possible always try to buy the best you can as it will pay off in the long run. With features such as double glazing throughout and storm, proof doors & windows and you will be thankful you did when the harsh realities of the UK weather ‘kicks in’. These L Shaped ‘Pyrford’ Log cabins are designed logically to be built easily. Their modular layout enabling a competent DIYer to build them and can be a joy to build. To enable the smallest amount of issues for the ‘end user’ these cabins are normally pre-built at the factory and this ensures that all parts are correct. It’s then bar-coded and finally flat packed before being delivered to you, the customer. If you rather someone installs this building for you we can normally recommend log cabin assembly teams who can assemble the cabin for you. Saving you time and you will find that the money spent is worth every penny. In this instance, all you need to is to enjoy your new building in your garden. That’s got to be a good option! With glossy log cabin brochures and flashy websites it’s very easy to be taken in by them. Whilst, undoubtedly, some can deliver what they are showing you will find that many don’t. A little like the ‘The Emperor’s New Clothes’ so be very wary as life is not like a fairy tale. Try to view, ideally, before buying so you can examine closely examples of the range of garden cabins made. Our log cabin display area near Woking in Surrey is available for you to see and examine examples of the Trentan cabin range. Whilst the number and styles may change on our display site there will also be a range of log cabins for sale to examine. By doing so you can examine the quality, look at the quality of wood used as well as the doors and windows and look at the general great design. And this can only be done by viewing the product. Don’t take chances of not viewing as it’s well worth doing – with ‘peace of mind’ free of charge! 1st Choice’s, which is a family business, background is in garden buildings manufacturing which started way back in 1979BT (before Thatcher). This experience is important for you to use and also helps to give us the know-how about the quality of materials. Our Ethos is ‘Make to a Standard – NOT down to a price’. Sizes: This Pyrford L Shaped log cabin is 4m x 4m x 2m. Note this is the external size of the body of the cabin. The lugs extend 100mm on each corner making the overall size (as most other companies quote) 200m larger. We mention this so you know you are comparing ‘eggs with eggs’. Approximate clear internal size will be approx100m less all round. Please check with us if internal size is crucial. Cladding: Nordic 44mm thick logs interlock into each other and are cut from a top grade of Nordic Timber ensuring the maximum stability and longevity of the timber. The log profile has designed wind-tight connections to ensure a superior resistance against wind. Untreated. Kiln dried timber from sustainable sources. Roofs: 18mm thick T&G boards used on the roof sections supported by strong roof beams. Supplied with felt tiles (shingles) in either red, brown or green or Polyester based felt as standard. 100mm (approx 4in) overhang all round. Roof beams meet EN 388 stringent standards. Untreated. Roof Overhang: To complement these log cabins there is approx 25cm front roof overhang all round. This adds further style to this building. Floors: 18mm thick T&G untreated boards used on these log cabin floors. All floor joists are pressure treated for long life as standard. No chipboard, OSB or other cheap sheet materials used on the floor, unlike some other log cabins UK suppliers. Floor joists are 45x45mm and are normally spaced no more than 650mm apart. Doors: Full length joinery arched effect quality double glazed toughened glass double doors 1244mm wide x 1850mm high (49in x 72½in) – approx sizes. Easy adjust hinges complete with gasket seals, fitted silver finish door handles, cylinder lock and two unique keys. Low doors sills giving you easier access into your log cabin. Beware of doors with single glazing or excessively high door sills. Supplied untreated. Georgian or plain style. Windows: Two (2) ¾ length, arched effect joinery quality inward opening windows are included as standard. Complete with easy adjust hinges, silicon gasket seals and delightful silver finish window handles. Supplied untreated as standard. Double glazed as standard NOT single glazed. Georgian or plain style. 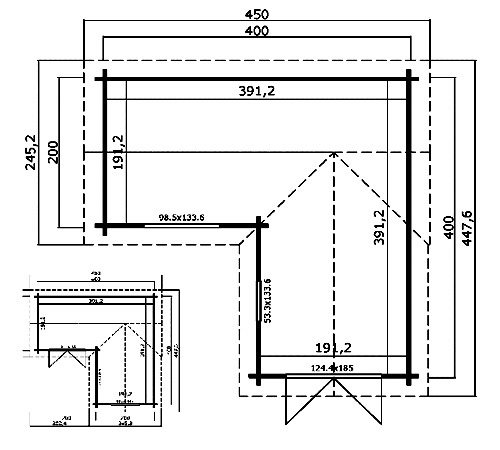 Lower Walls: Height – 210mm (82½in) – on all our L shaped log cabin kits for sale. Ridge Height: 2514mm (95½in) – on all Pyrford L shape log cabins. 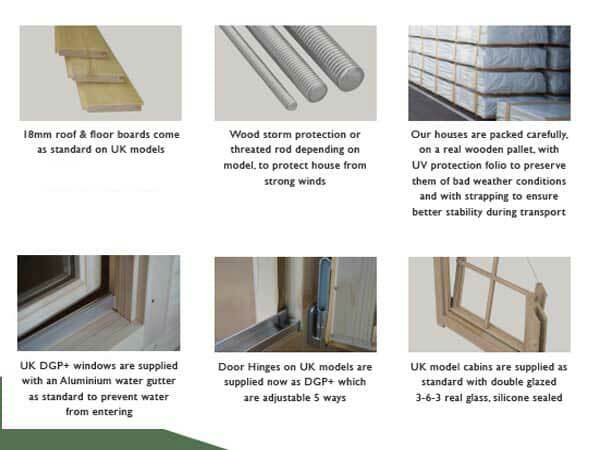 Storm Protection As standard are either ‘Wood Storm Protectors’ or threaded rods for strength. This helps to ensure that the logs on your cabin will remain stable and tight together depending on the weather. Treatment: All log cabins are supplied untreated so you can apply the treatment to suit you and you garden. Assembly: Log cabins are supplied in kit form for self fitting. Option for installation through a third party if required. 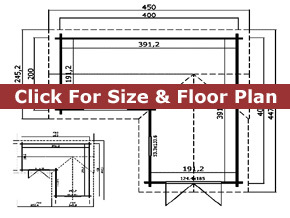 If you use this assembly service you would need a concrete base or solid and level paving slab base. Optionally, we have an option for building a base for you in certain areas. These log cabins are assembled by interlocking the panels for ease of taking it down again if you decide to move. Delivery: All log cabins are delivered and craned off the lorry for you free of charge throughout central & Southern England. Deliveries to Scotland would cost £150 extra. Deliveries to Cornwall & Devon, South & West Wales and Northern England would cost an extra £60. An addition to the modern garden is a log cabin as they are strong in appearance and the natural wood blends in naturally. And this is where the ‘Pyrford’ L Shaped log cabin scores. Its delightful design and its ability to fit into any garden in a corner plot make this an ideal garden room for your family & the ‘Pyrford’ L shaped cabin ticks all the boxes. Key to this is the great design built in. To ensure that you buy what you think you are buying always view the cabins beforehand by visiting a display site and taking a good luck at the buildings. We have garden cabin display areas near Woking and Farnham in Surrey where you can see how good these buildings are for your self.